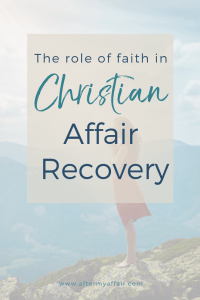 What role does faith and Christian affair recovery come in? Some may ask, why do I have a faith page on this website and what is “christian affair recovery”? as God was the source of my own christian affair recovery. I would be remiss not to share the whole story of how God was instrumental in healing and restoring our marriage too. who are in this healing and recovering process together! Request to join my facebook group here. 1. Jesus has been with me from the beginning. To back track a bit, I had decided to fully commit my life to Jesus at the age of seventeen. I spent many years close to God and loved reading his word. It was only after slipping in my prayer time and not filling my mind with His word that I began my slippery, but gradual, slope to infidelity. while I was at my worst. There’s not too many humans that would do that right? was by my side and helped us through. How could I not honor Him here? 2. God helped me personally heal from the shame of my infidelity. First, my personal experience is that I would not have been healed in my heart, or been able to forgive myself of my affair, if I didn’t have God helping me. some power over us. But when we’re authentic with others, and get honest about our mistakes, Satan loses. (But I would advise being wise in who you share your truth with, not everyone can handle it and some people take pleasure in shaming others). living authentically, after we’ve failed in some way. Shame was one of the biggest hurdles I had to overcome afterwards. That was a hard one for me to get past. But I remembered that even David, who was a man after God’s heart and loved God, committed adultery with Bathsheba. That’s not to excuse our sin, but to show that we are all capable of falling. I truly believe it is when we say in our hearts “I WOULD NEVER DO THAT…” that we are indeed at our most vulnerable of falling. Then we get caught in the trap the enemy has set for us and getting free becomes very difficult to do on our own. I had to recognize those words of condemnation as being the lies that they were, sprinkled with just enough truth. in the hope that other Christian women will stop hiding in shame, and get the help from God that He offers. 3. There’s an enemy of our souls who makes it his job to condemn us. If Satan can keep you in condemnation over committing adultery, or any other mistake you’ve made, then he’s got you under his thumb. and in your marriage, when you’re still feeling condemned. Sometimes, Satan will still whisper condemning thoughts in my mind. And it’s hard for even me to understand how I could do this. Satan will try to do and say all he can, to keep us in our pit of shame and guilt. He is always faithful and just and will forgive us our sins and cleanse us from that unrighteousness. Once you know you’ve done that, then continuously being tormented by the enemy is just him lying to you. Satan loses when you reject his words of shame and condemnation and chose truth and vulnerability instead. Using scripture to deal with temptations the enemy puts in your mind is also important. and be sure to get my free printable of ‘30 powerful scriptures to change your life’, here. 3. God took any desires I had to be with the affair partner. Jesus is the one who took the desire for this other man out of my heart, when I couldn’t do it by myself. (Believe me, I’d tried). I know it was God, because once I finally got serious and asked Him to take it from me, I felt a release, and was able to let go. Sometimes women will ask me if there’s ever feelings that linger for an affair partner. They wonder if they’ll always feel love for them, or always miss them. I can answer only for myself, but my answer is no. There is honestly no feelings for him, and if anything, only disgust. I see it all from a distance now and realize the vulnerability I was in at that time, and this man knew it too. True love rejoices in the truth, the bible says. So would someone who says they really love you, be encouraging you to lie and hide the truth? Would that person want you to sin against God and your husband, and dishonor your marriage vows if it was real love? Once God showed me this, my eyes were opened in other ways too. How could I long for someone like that anymore? Let God show you too, my friend. If you’re still struggling with longing for and missing your affair partner. Only God can truly free us from whatever trap we’ve gotten into, if we want to be freed bad enough. 4. God is the one that restored the love in our marriage. God was the glue we needed to bind our marriage together as we began to pray daily together. He also helped my husband to forgive me and replace the anger with compassion much sooner than I think he would have on his own. As we prayed and invited Him into our messy recovery, He was there and bound us together again. That is what I mean by Christian Affair Recovery. my free e-book on some of the most important things we did. but will just offer some observations, scriptures and devotions as we seek healing from our past. If you’d like to learn more about how to have a relationship with Jesus, you can follow this link to my How to know God page. If you’re looking for posts for the unfaithful wife, click here. If you’re a betrayed husband, click here.